Welcome to the world-famous Shark Alley, the great white shark capital of the world. We'll take you into the natural home of these incredible apex predators on a trip which is safe, comfortable and will change your life forever. Marine Dynamics is made up of a team of shark enthusiasts, including five marine biologists and a knowledgeable skipper who constantly strive to place shark conservation and education foremost. This is done through educating clients on a daily basis, by conducting research and by maintaining structured marine education and development projects. Marine conservation has historically been grossly neglected and this vacuum in the scientific arena necessitates new, exciting and ongoing research projects to find out more about our precious marine species and the ecosystems in which they live. And this is exactly what we do! Shark education features as a prominent part of our activities. It is only by getting to know these complex creatures more intimately, that we will understand the impact of their current continuing decline. 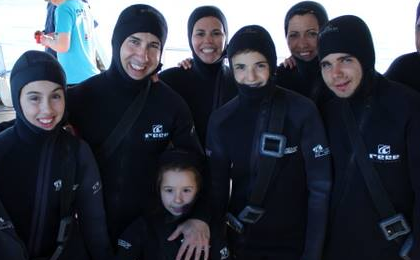 Therefore, education plays a pivotal role in our shark cage diving excursions. 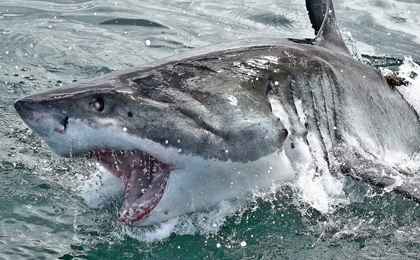 Diving – So… you want an eyeball to eyeball encounter with a Great White Shark in South Africa? The crew have unrivalled experience and expertise with a dedicated Marine Biologists on every trip. Our multi-million rand custom designed purpose-built boat is the only one of its kind in the industry. We are a multifunctional and award winning eco-tourism enterprise ready to rock your boat in more than one way! 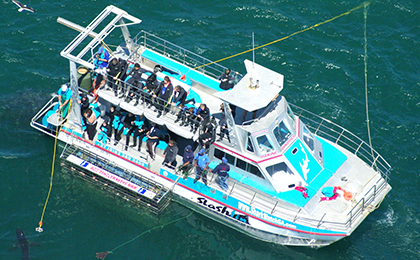 Celebrate a major event with an exclusive shark cage diving trip! The Slashfin resembles the remarkable qualities of the Great White Shark species after which it is named: sleek, streamlined and elegant with amazing power and steadiness to graciously slice through the water and effortlessly endure the most extreme sea conditions. Slashfin is built for low maintenance, stability, speed and superior safety and comfort. The boat can comfortably accommodate 40 passengers plus the crew at a time. Slashfin is powered by four large four-stroke 300 hp outboard engines. What can you tell me about the Cage? Taking the plunge to actually get into the cage can be a bit scary if it is your first introduction to the iconic top-predators of the ocean, but rest assured. It is extremely unlikely that a shark will be able to break into a cage, or will be more interested in you than the juicy tuna head or decoy that our expert bait handler throws into the water to lure them closer. The bait is not fed to the sharks – it is merely used to entice them to come closer to the cage and is pulled back before they can get to it. 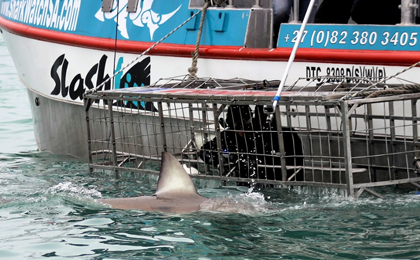 Never in the 15 years of the business has a Great White Shark shown anything but mere cautious curiosity in any of the tourists in the cages! The sturdy steel cage is professionally engineered and made out of a 25mm galvanised mild steel covered with 10mm galvanised mild steel security mesh. It has no sharp edges on which a shark can injure itself. The cage is firmly secured to the side of the boat and divers can easily get out whenever they want to. The cage never sinks or floats away. The steel hand and foot bars inside the cage offer ample grip and support to pull yourself up or to push down. Your head will never be more than a metre under the surface and you can decide when and how long you want to stay underwater. What happens on each trip? Why is the boat called Slashfin? The name ‘Slashfin’ was inspired by the tenacious survival instincts and healing powers of a legendary 3,3m young male shark that grabbed the imagination of shark researchers who followed his migrating patterns and recovery over a number of years. Dubbed Slashfin after the severe damage caused to his dorsal fin – probably by a propeller or an unfortunate encounter with other sharks – the shark cage diving community was able to identify him and follow his recovery for over six years during his annual visits to the Dyer Island area between March and July. The fin used to be shredded to pieces and the researchers were astonished to see how well it healed so that now it is only distinguished by two parallel scars. Slashfin has grown by at least 1 and a half metres since he was first spotted in the Gansbaai area. He is still a famous and favourite annual visitor to our waters and who knows, he may even be aware that he has been immortalised on our boat! The great white shark capital of the world.